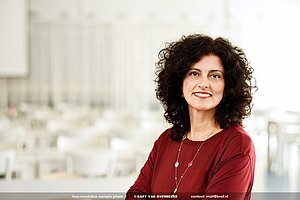 Eva Demerouti, Professor at Human Performance Management, will take on the task to enhance diversity at TU/e. She does not want that job to be cold comfort for the present situation – it should actually contribute to a pleasanter working climate. “It is essential that there should be a diversity policy at TU/e”, says Demerouti, originally an industrial and organizational psychologist. “Firstly, this is still very much a male environment and, secondly, TU/e is facing numerous challenges for which greater diversity of its staff members may be useful.” She is referring to the pressure felt by researchers in relation to publications, citations and the acquisition of projects. Moreover, TU/e as an organization feels a need to excel, for instance in the rankings.